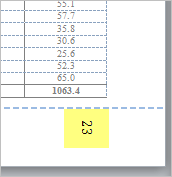 Rotate Landscape page numbers to match Portrait layout. 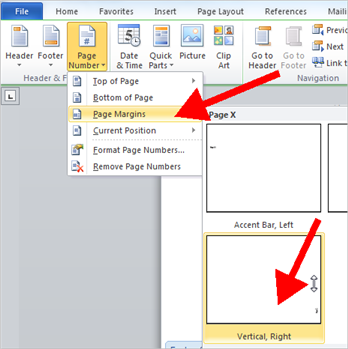 This article details how to rotate landscape page numbers to match the Portrait layout. 1. First, be sure that you have created section breaks (not just simple page breaks) in order to allow for the portrait and landscape pages. 2. Navigate to the page you need to modify (in this example, Page 3). On the Header and Footer toolbar, click Link to Previous so that the button appears off (not depressed). 4. Select Page Margins and then Vertical, Right. 6. 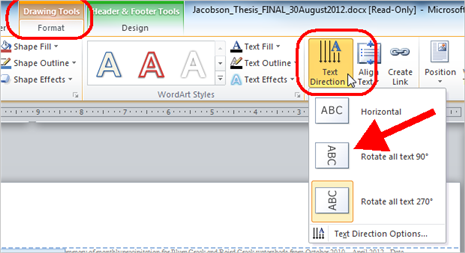 Select the text box and select Text Direction from the Drawing Tools, Format menu. 7. Clean up the number formatting with the normal page tools on the HOME tab such as sizing the font and aligning the page number to the right. 8. When you’re done the number should be in the same direction as your other portrait pages.